Do You Need To Start A Newsletter? Start a newsletter! That’s what you’ve decided but it can be very daunting. Yet another thing you need to do. And with all the hype over GDPR it can be even scarier. When we start something new there is always a learning curve. Everyone told me I needed to start a Newsletter, but they didn’t tell me the things I needed to do. I had to find out myself. What sort of things were they? The legal stuff, the things that help you get people to sign-up and the unexpected. I’ve put a pdf together so you can get your hands on that information before you start a newsletter. And because (I have to confess, I need reading glasses sometimes now), I’ve prepared it so you can read it on your phone and don’t need a 15″ laptop to read it on. 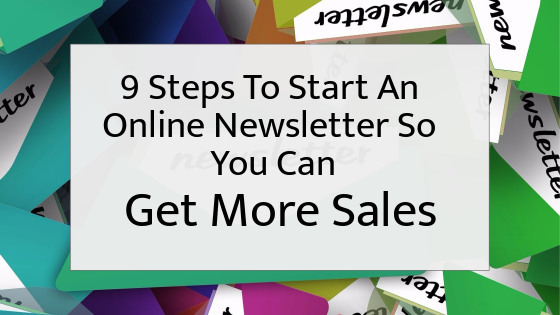 You can get your hands on my free pdf : 9 Steps To Start An Online Newsletter – you’ve guessed it- by subscribing to my mailing list. You can always unsubscribe again afterwards, I won’t be offended but if you’re thinking of starting a newsletter you will find the emails I send you very helpful. My newsletter has been going a while now. There is always something new to learn and I share what I learn with my subscribers. It’s such a good way to keep in touch with people and I love to hear from you, what you think and anything else you would like to know which I can add to a future newsletter. It applies to people like myself, people who run their business single-handedly, without employees. If you keep records of the under 16s you need to take extra care and I would be pleased to help you with that. Did You Subscribe To My Mailing List?